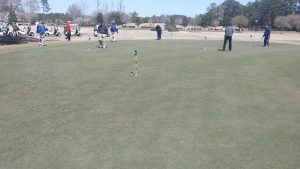 After several months of grow-in, a new putting green has opened at the beginning of the back nine on Farmstead Golf Links. Designed and placed to allow golfers waiting at the turn to practice before starting the back nine, the putting green opened this week. The green was designed by Farmstead Golf Links architect David Johnson and built by Shapemaster.